CAMCOPTER S-100 succesfully concludes operations in support of MOAS’ life-saving mission. Malta, 21 November 2016 – Onboard the global charity organization MOAS’ (Migrant Offshore Aid Station) ship MY Phoenix Schiebel’s CAMCOPTER® S-100 again proved to be vital for the outstanding achievements of the NGO’s search-and-rescue efforts in the Mediterranean. During this year’s mission, that started from Valetta, Malta, at the beginning of June, more than 19 000 men, women and children in emergency situations have been saved from drowning in the sea on their attempt to cross the Mediterranean by the MOAS’ crew - in partnership with the Italian Red Cross. These results are a huge increase compared to the already impressing numbers of the same rescue missions in 2014 and 2015. Since MOAS launched in 2014, a total of around 30 000 persons have been rescued and assisted with medical aid. “When it comes to shipborne search-and-rescue missions, the better all available assets are used, the more people can be saved. That is the reason why the role of our CAMCOPTER® S-100 has once again been so crucial; the information it generates makes up for the best possible coordination of all actors and resources involved in the mission.”, explains Hannes Hecher, CEO of the Vienna-based company. 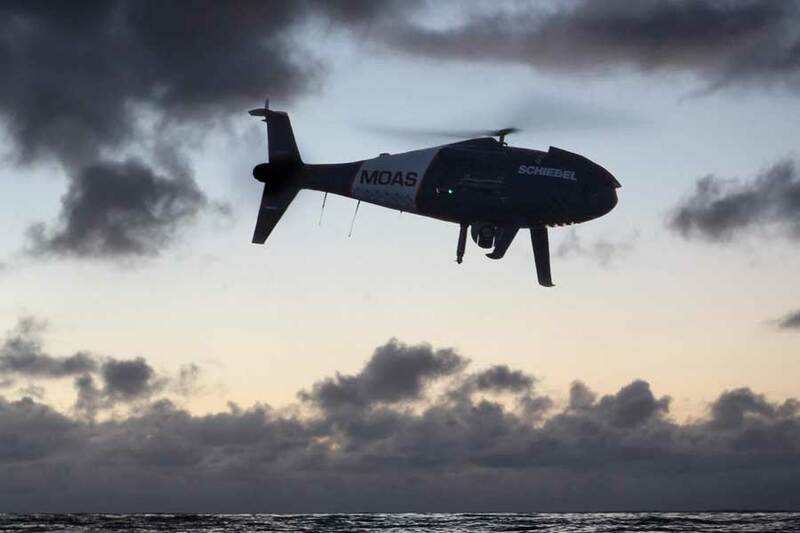 During this year’s mission, as in 2014 and 2015, Schiebel provided MOAS with a CAMCOPTER® S-100 system - the world’s leading unmanned helicopter solution for maritime tasks - as well as with an experienced team of onboard operators. Founded in 1951, the Vienna-based Schiebel Group focuses on the development, testing and production of state-of-the-art mine detection equipment and the revolutionary CAMCOPTER® S-100 Unmanned Air System (UAS). Schiebel has built an international reputation for producing quality defense and humanitarian products, which are backed by exceptional after-sales service and support. In 2010, Schiebel’s new composite division has started to supply high-tech customers with products of supreme carbon fiber technology – all quality-controlled to meet ISO 9001 standards. With headquarters in Vienna (Austria), Schiebel now maintains production facilities in Wiener Neustadt (Austria) and Abu Dhabi (UAE), as well as offices in Washington DC (USA) and Phnom Penh (Cambodia). Schiebel’s CAMCOPTER® S-100 Unmanned Air System (UAS) is a proven capability for military and civilian applications. The Vertical Takeoff and Landing (VTOL) UAS needs no prepared area or supporting launch or recovery equipment. It operates in day and night, under adverse weather conditions, with a beyond line-of-sight capability out to 200 km, both on land and at sea. The S-100 navigates via pre-programmed GPS waypoints or is operated with a pilot control unit. Missions are planned and controlled via a simple point-and-click graphical user interface. High definition payload imagery is transmitted to the control station in real time. Using “fly-by-wire” technology controlled by a flight computer, the UAV can complete its mission automatically. Its carbon fiber and titanium fuselage provides capacity for a wide range of payload/endurance combinations up to a service ceiling of 18,000 ft. In its standard configuration, the CAMCOPTER® S-100 carries a 75 lbs/34 kg payload up to 10 hours and is powered with AVGas or heavy fuel. MOAS is an international search and rescue NGO based in Malta and founded by entrepreneurs Christopher and Regina Catrambone. Since late 2014, MOAS has rescued and assisted over 30 000 people attempting the dangerous sea crossing to Europe. After becoming the first private rescue operation in the Mediterranean, MOAS spurred other NGOs and the EU to respond directly to the mass casualties. MOAS is currently operating in the Central Mediterranean with two vessels – MY Phoenix and MY Responder – in partnership with the Red Cross.